Story: Detective Casey is a police detective who helps Chief O'Hara and Mickey Mouse on their cases from time to time. Background notes: Detective Casey first appeared in the Mickey Mouse newspaper strip in 1938 in the story The Plumber's Helper, which ran from July 2nd to December 10th. His second appearance was in the now classic tale Mickey Mouse Outwits the Phantom Blot from the newspaper strips in 1939. It is very likely the reason he stayed in use from time to time in the following years, unlike the two visually similar characters, Ebenezer Higglesby and Joe Piper. They had their first appearances in The Plumber's Helper also, but are almost forgotten today. Up until 1960 Casey was only used in a few U.S. and Italian stories, but then in 1960, for some reason, the Italians started using the character on a regular basis, and continued to do so since then. An interesting thing to note about Detective Casey is that he is still allowed to keep his cigar. 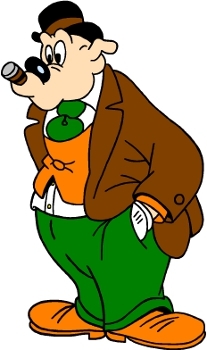 While other characters have stopped smoking as it has become politically incorrect, Detective Casey is still smoking his cigars. Outside comics, Detective Casey has apparently only been seen as a couple of figurines. Most likely other pieces of merchandise have been produced as to characters goes back 70+ years, but the amount of merchandise with the character is sparse.